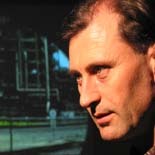 Simon Penny is an Australian artist, theorist, teacher and curator in the fields of Digital Cultural Practices, Embodied Interaction, Art and Technology and Interactive Art. His art practice consists of interactive installation and robotic art utilising custom sensor and robotic technologies. He is co-developer of the TVS multi-camera 3D machine vision system. His works have been exhibited at ZKM, Ars Electronica, the Australian Center for the Moving Image (ACMI) and elsewhere. He has published essays on digital culture since 1987 (translated into eight languages) and has spoken widely on Electronic Media Art around the world. He edited the anthology Critical Issues in Electronic Media (SUNY Press 1995). He curated Machine Culture (arguably the first international survey of interactive art) for SIGGRAPH 93. Penny is Professor of Arts and Engineering at University of California Irvine. He is architect and founding director of the transdisciplinary graduate program ACE (Arts, Computation and Engineering) at UCI.through the 1990’s he was Professor of Art and Robotics at Carnegie Mellon.